A recent Finnish study of 30,000 men suggests that young fathers may have a reduced life expectancy. 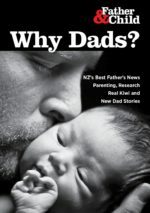 On Wednesday morning, Father & Child support worker Brendon Smith was interviewed on NewstalkZB by Mike Hosking. You can listen to the interview with Brendon on early the death of young fathers here – it starts at 8 mins 30 seconds in. Update: sorry, this link only worked for a week. Background: Previous studies have shown that young fatherhood is associated with higher later-life mortality. It is unclear whether the association is credible, in the sense that mortality and young fatherhood appear to be associated because both are determined by family-related environmental, socioeconomic and genetic characteristics. Methods: We used a household-based 10% sample drawn from the 1950 Finnish census to estimate all-cause mortality of fathers born during 1940–1950. The fathers were followed from age 45 until death, or the end of age 54. We used a standard Cox model and a sibling fixed-effects Cox model to examine whether the effect of young fatherhood was independent of observed adulthood characteristics and unobserved early-life characteristics shared by brothers. Results: Men who had their first child before the age of 22 or at ages 22–24 had higher mortality as compared with their brothers who had their first child at the median or mean age of 25–26. Men who had their first child later at ages 30–44 had lower mortality than their brothers who had a first child before the age of 25. The pattern of results from a standard model was similar to that obtained from a fixed-effects sibling model. Conclusions: The findings suggest a causal effect of young fatherhood on mortality and highlight the need to support young fathers in their family life to improve health behaviours and health.